Cameron, writes Dean Adams on SuperbikePlanet.com, is easily one of the most well read and well known motojourno scribes on the planet. His column--TDC--is read with interest each month by everyone who fancies himself a serious mover or shaker or even serious enthusiast. From Marlboro Roberts mechanics in Europe to a quiet woodworker in LaCrosse Wisconsin, all read his columns in Cycle World and Motorcycle International, addicted to the imagery. 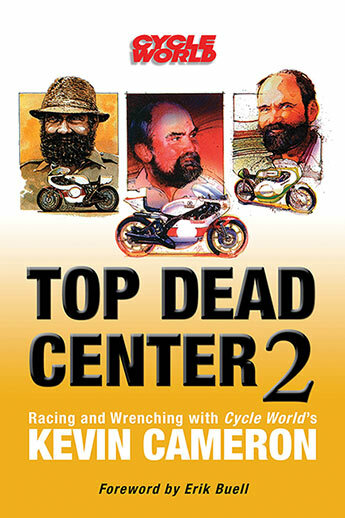 Enthusiasts, aficionados, and addicts alike will find something to celebrate and plenty to simply enjoy in this second collection of the incomparable Kevin Cameron's articles and columns from Cycle and Cycle World magazines. Sometimes technical, sometimes philosophical, always entertaining, the pieces are arranged thematically, and Cameron provides a brief introduction putting each into context. In the wide world of motorcycle writing, there is no one quite like Kevin Cameron--and nothing quite like the opportunity this book offers for joining him on a long, entertaining, enlightening ride.